Received July 13, 2017; Revised October 28, 2017; Accepted December 11, 2017. Pyrenophoratritici-repentis is the causal agent of tan spot. According to their ability to produce necrosis and/or chlorosis on a set of four differential bread wheats, the isolates of this fungus are currently grouped into eight races. When durum wheat genotypes were added to the differential set, a new virulence type was identified in Algeria. 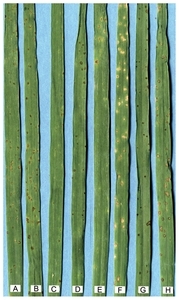 The isolates showing this virulence pattern are unable to attack bread wheat while they cause necrosis in durum genotypes. In this work, characterization of those isolates was based on pathological and molecular aspects. This included inoculation of bread and durum wheat, and virulence gene analysis using PCR and sequencing. The results showed that all isolates caused a resistance on all bread wheats of the differential set, while they produced necrosis in durum. ToxA and ToxB genes were amplified in all isolates, whereas toxb was absent. Sequence analysis for both genes showed no differences with those found in the two functional genes. The presence of two genes, ToxA and ToxB, despite the absence of symptoms usually caused by their products, suggests the existence of a new homologous for these two genes yet unknown. The presence of ToxA in the isolate unable to produce necrosis in Glenlea is reported for the first time. Pyrenophora tritici-repentis is the causal agent of tan spot, a disease responsible for large economic losses in wheat-growing areas worldwide. The typical symptoms of wheat susceptible genotypes include large necrotic lesions surrounded by chlorosis, whereas in resistant genotypes the symptoms are limited to small circular lesions (Faris et al., 2012). Tan spot development depends on the ability of the fungus to produce host-specific toxins (De Wolf et al., 1998; Lamari and Bernier, 1989). Three host-selective toxins PtrToxA, PtrToxB, and PtrToxC have been isolated to date. According to their ability to produce necrosis and/or chlorosis on a set of four bread wheat genotypes, the isolates of this fungus are currently grouped into eight races (Lamari and Strelkov, 2010). When three durum wheat genotypes were added to the differential set, a new virulence pattern was identified (Benslimane et al., 2011). Isolates showing this new virulent pattern are able to produce necrosis only in durum wheat genotypes, whereas the bread wheat genotypes of the differential set were resistant. The objective of this study is to characterize the isolates of a new virulence pattern of P. tritici-repentis, based on pathological and molecular traits. The virulence of isolates Ptr24, Ptr65, Ptr68 and Ptr76 was tested, on a set of differential wheat genotypes composed of 5 bread wheat (6B-365, Glenlea, 6B-662 and Salamouni and Katepwa) and 3 durum wheat (4B-160, Coulter, and 4B-1149) genotypes. Isolates Asc1, 90-2 and Alg3-24, corresponding respectively to three known races (1, 4, and 5) were used as controls. Compared to the last study, we introduced Katepwa because this genotype possesses both sensitivity genes to PtrToxA and PtrToxB (Lamari et al., 2003; Strelkov et al., 2002). Inoculum production and inoculation were performed according to Lamari and Bernier (1989) with few modifications, as described in our previous paper (Benslimane et al., 2011). The virulence test was made twice; each treatment was replicated four times. Mycelium production and DNA extraction were performed following a modified Promega Protocol, as previously described (Benslimane et al., 2013). Then it was homogenized for all samples at 10 ng. For virulence genes amplification, the primers listed in Table 1, were used. Primers TB71F/TB60R amplified both ToxB in race 5 and the ToxB-like sequence in race 3; primers TB71F/TB58 amplified toxb from race 4. TA51F and TA52R amplified ToxA (Andrie et al., 2007). The reaction conditions were as follow: 1× Taq polymerase buffer, 300 μm each dNTP, 0.5 μm each primer, 1.25 U of Taq polymerase, and 50 ng of DNA template in 25 μl. Following an initial 1 min, 94ºC denaturation, samples underwent 35 cycles of 94ºC for 45 s, 58ºC for 30 s, and 72ºC for 1 min, ending with a final 7 min extension at 72ºC. We repeated PCR on at least three independent DNA samples. Finally, the sequencing of ToxA and ToxB genes has been performed by Sanger technology (GATC biotech, Constance, Germany) using primers listed in Table 1. Amplicons were sequenced in both reverse and forward directions. Sequences were then aligned using ClustralW software (Conway Institute UCD Dublin, Ireland) (Thompson et al., 1994) with the standard sequences of ToxA (gi|2209140|gb|AF004369.1|) and ToxB (gi|46576199|gb|AY425485.1|). Our results show that all isolate inoculation with Ptr65, Ptr68, Ptr24, and Ptr76 caused a resistance reaction on only the five bread wheat genotypes (Glenlea, 6B365, 6B662, Salmounela, and Katepwa). This resistance is expressed through a small black or dark brown spot, sometimes surrounded by a yellow halo (Fig. 1). The isolates used caused necrosis in two durum wheat genotypes (4B160 and Coulter) (Fig. 1). This confirmed the previous results and then excluded any confusion possibility with race 1, 4 or 5. Consequently, the virulence type reported, is new and should belong to a new race. ToxA and ToxB genes were amplified on all DNA isolates studied (Fig. 2), while toxb gene has been amplified in no one of them (Fig. 2). Sequences alignment analysis for both genes, revealed no difference with functional genes, encoding for PtrToxA and PtrToxB toxins, the sequences did not harbor any mutation. The gene parts targeted in this analysis were 415 pb and 103 pb for ToxA and ToxB, respectively. The resistance of Katepwa is a further evidence of the absence of ToxA and ToxB gene products. Indeed, genetic analyses showed that this genotype harbored in its genom two independent loci, which are responsible for the sensitivity to toxins PtrToxA and PtrToxB (Gamba et al., 1998). When these toxins are produced, they cause chlorosis and/or necrosis in Katepwa, according to the toxin produced (Lamari et al., 2003; Strelov and Lamari, 2003); consequently, virulence genes products would cause one symptom, or both of them. Molecular characterization of the isolates with a new virulence pattern highlighted the presence of ToxA and ToxB in their genomes. The presence of two genes encoding PtrToxA and PtrToxB, despite the absence of symptoms usually caused these toxins, suggests a new homologous gene unknown yet. Therefore, these isolates harbored in their genomes ToxA and ToxB alleles forms, which seem identical to those found in functional genes. However, analyzed areas were limited to one part of the genes; the occurrence of point mutations in another region of both genes is strongly considered. In fact, the used primers amplified a portions of 573 pb and 232 pb of ToxA and ToxB respectively, within the ORFs (open reading frames) (Andrie et al., 2007). In addition, the gene parts targeted after sequencing are smaller, as a result of sequencing errors that led to shorter analyzed sequences. A mutation upstream of the studied sequences, located at the beginning of the coding region, could explain the absence of the two gene products. Lacking ToxA and ToxB expression could be also a result of one or more mutations in the promoters; these can affect gene expression or cancel it completely. Similar cases have been described in P. tritici-repentis. In fact, toxb found in race 4 is a homolog of ToxB gene, that shows on one hand a difference at the promoter, and on the other hand in the coding region, that controls the mature protein synthesis (Strelkov, 2002). Consequently toxb gene is expressed very weakly (Amaike et al., 2008). Another homolog of ToxB was also identified in race 3, in which no detectable activity of PtrToxB is known (Martinez et al., 2004; Strelkov et al., 2006). However, to date no ToxA unable to produce PtrToxA has been described yet. Located on chromosome 3Mb (Lichter et al., 2002), this gene is known to be present in single copy in all races of P. tritici-repentis producing PtrToxA, whereas it is completely absent in other races not producing this toxin. PtrToxA causes a specific necrosis symptom in wheat hosts carrying the matching receptor (such as ‘Glenlea’), so any PtrToxA isolate should be capable of causing that specific necrosis symptom (Strelkov and Lamari, 2003). Several studies have shown that ToxA appears to be highly conserved among isolates collected from different geographical regions (Ballance et al., 1996; Ciuffetti et al., 1997; Friesen et al., 2006). The presence of a homolog of ToxA in P. tritici-repentis is reported for the first time. Considering the biochemical nature and biosynthesis of PtrToxA and PtrToxB toxins, several factors may account for the lack of ToxA and ToxB genes expression among isolates Ptr24, Ptr65, Ptr68 and Ptr76. Cloning of the ToxA gene revealed that it codes for a 19.7 kDa pre-proprotein, which undergoes proteolytic processing to yield the mature toxin (Ballance et al., 1996; Ciuffetti et al., 1997). Similarly, PtrToxB controlled by ToxB gene is a protein with a low molecular weight of 6.6 kDa (Strelkov et al., 1999). ToxB codes for an 87-amino acid residue protein, including a 23-residue signal peptide, which is cleaved off to give a mature protein 64 residues long (Martinez et al., 2001; Strelkov, 2002). These effects suggest that toxin synthesis may be affected by a wide range of mechanisms, that are used by eukaryote cells to increase or decrease specific gene products. Because of the complexity of gene regulation, ToxA and ToxB gene expressions could be affected at several stages; in fact, there are many steps in the pathway leading from DNA to protein, and all of them can be regulated. This includes structural changes in the chromatin to make a particular gene accessible for transcription, transcription of DNA into RNA, splicing of RNA into mRNA, editing and other covalent modifications of the mRNA, translation of mRNA into protein, and finally, post-translational modification of the protein into its mature functional form (Nestler and Hyman, 2002). Further research is necessary to understand the virulence gene inhibition reported thru our study, along with a host pathogen interaction analysis. Fig. 1. Reaction phenotypes of eight differential wheat genotypes to the new virulence profile found in four Algerian isolates of Pyrenophora tritici-repentis. (A) Resistance of Glenlea, (B) Resistance of 6B365, (C) Resistance of 6B662, (D) Resistance of 4B1149, (E) Resistance of Katepwa, (F) Sensitivity of Coulter, (G) Resistance of Salamouni, (H) Sensitivity of 4B160. Amaike, S, Ozga, JA, Basu, U, and Strelkov, SE (2008). Quantification of ToxB gene expression and formation of appressoria by isolates of Pyrenophora tritici-repentis differing in pathogenecity. Plant Pathol. 57, 623-633. Andrie, RM, Pandelova, I, and Ciuffetti, LM (2007). A combination of phenotypic and genotypic characterization strengthens Pyrenophora tritici-repentis race identification. Phytopathology. 97, 694-701. Ballance, GM, Lamari, L, Kowatsch, CC, and Bernier, CC (1996). Cloning, expression and occurrence of the gene encoding the Ptr necrosis toxin from Pyrenophora tritici-repentis. Molecular Plant Pathology On-Line. Benslimane, H, Lababidi, S, Yahyaoui, A, Ogbonnaya, F, Bouzna, Z, and Baum, M (2013). Genetic diversity of Pyrenophora tritici-repentis in Algeria as revealed by amplified fragement length polymorphism (AFLP) analysis. Afr J Biotechnol. 12, 4082-4093. Benslimane, H, Lamari, L, Benbelkacem, A, Sayoud, R, and Bouznad, Z (2011). Distribution of races of Pyrenophora tritici-repentis in Algeria and identification of a new virulence type. Phytopathol Mediterr. 50, 203-211. Ciuffetti, LM, Tuori, RP, and Gaventa, JM (1997). A single gene encodes a selective toxin causal to the development of tan spot of wheat. Plant Cell. 9, 135-144. De Wolf, ED, Effertz, RJ, Ali, S, and Francl, LJ (1998). Vistas of tan spot research. Can Plant Pathol. 20, 349-370. Friesen, TL, Stukenbrock, EH, Liu, Z, Meinhardt, S, Ling, H, Faris, JD, Rasmussen, JB, Solomon, PS, McDonald, BA, and Olivier, RP (2006). Emergence of a new disease as a result of interspecific virulence gene transfer. Nat Genet. 38, 953-956. Faris, JD, Abeysekara, NS, McClean, PE, Xu, SS, and Friesen, TL (2012). Tan spot susceptibility governed by the Tsn1 locus and ace nonspecific resistance quantitative trait loci in a population derived from the wheat lines Salamouni and Katepwa. Mol Breeding. 30, 1669-1678. Gamba, FM, Lamari, L, and Brûlé-Babel, AL (1998). lnheritance of race-specific necrotic and chlorotic reactions induced by Pyrenophora tritici-repentis in hexaploid wheats. Can J Plant Pathol. 20, 401-407. Lamari, L, and Bernier, CC (1989). Virulence of isolates of Pyrenophora tritici-repentis on wheat cultivars and cytology of the differential host reactions. Can J Plant Pathol. 11, 284-290. Lamari, L, and Strelkov, SE (2010). The wheat/Pyrenophora tritici-repentis interaction: progress towards an understanding of tan spot disease. Can J Plant Pathol. 32, 4-10. Lamari, L, Strelkov, SE, Yahyaoui, A, Orabi, J, and Smith, RB (2003). The identification of two new races of Pyrenophora tritici-repentis from the host centre of diversity confirms a one-to-one relationship in tan spot of wheat. Phytopathology. 93, 391-396. Lichter, A, Gaventa, JM, and Ciuffetti, LM (2002). Chromosome based molecular characterization of pathogenic and non-pathogenic wheat isolates of Pyrenophora tritici-repentis. Fungal Genet Biol. 37, 180-189. Martinez, JP, Ottum, SA, Ali, S, Francl, LJ, and Ciuffetti, LM (2001). 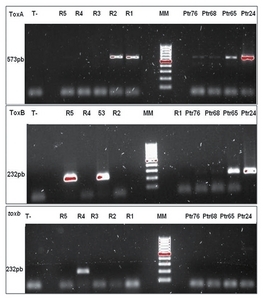 Characterization of the ToxB gene from Pyrenophora tritici-repentis. Mol Plant-Microbe Interact. 14, 675-677. Martinez, JP, Oesch, NW, and Ciuffetti, LM (2004). Characterization of the multiplecopy host-selective toxin gene, ToxB, in pathogenic and non-pathogenic isolates of Pyrenophora tritici-repentis. Mol Plant-Microbe Interact. 17, 467-474. Strelkov, SE 2002. Occurrence and expression of ToxB and comparative virulence of chlorosis inducing races of Pyrenophora tritici-repentis. PhD thesis. University of Manitoba. Winnipeg, Canada. Strelkov, SE, and Lamari, L (2003). Host-parasite interactions in tan spot [Pyrenophora tritici-repentis] of wheat. Can J Plant Pathol. 25, 339-349. Strelkov, SE, Lamari, L, and Balance, GM (1999). Characterization of a host-specific protein toxin (Ptr ToxB) from Pyrenophora tritici-repentis. Mol Plant-Microbe Interact. 12, 728-732. Strelkov, SE, Lamari, L, Sayoud, R, and Smith, R (2002). Comparative virulence of chlorosis-inducing races of Pyrenophora tritici-repentis. J Plant Pathol. 24, 29-35. Strelkov, SE, Kowatsch, RF, Ballance, GM, and Lamari, L (2006). Characterization of the ToxB gene from North Africa and Canadian isolates of Pyrenophora tritici-repentis. Physiol Mol Plant Pathol. 67, 164-170. Thompson, JD, Higgins, DG, and Gibson, TJ (1994). CLUSTALW: improving the sensitivity of progressive multiple sequence alignment through sequence weighting, position-specific gap penalties and weight matrix choice. Nucleic Acids Res. 22, 4673-4680.